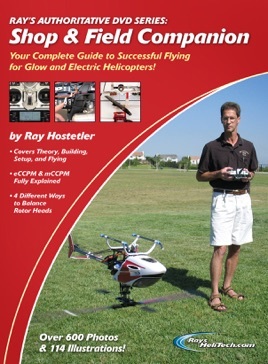 Ray's Shop and Field Companion will take you through the theory of helicopter flight, tools needed for building and setup, hovering, forward flight, and basic aerobatic maneuvers. I have been pretty much self taught at RC helis, since there isn't a mentor in my area. I have rebuilt a lot of helis, but you really don't know what you don't know. Ray's Helitech has evolved my understanding of helicopter building substantially. After reading a section in his book, I would go tear into my 450 and see what could be improved upon. I always thought I built well, but I was surprised at how little I knew. After applying what I have learned, my Heli is absolutely the smoothest and best performing it has ever been! Ray is incredibly thorough at building helis, and his attention to the smallest detail is incredible. I haven't even started using his method of blade balancing yet, it is so thorough. I hope that one day I build as well as he does, but he really is the mechanical master! This book isn't cheap by ebook standards, but if you aren't willing to part with the money, you are only settling for mediocrity. Thank you so much, Ray! I'm not able to see most of the photos and illustrations, they aren't available in some parts or partially shown on others. I'm very disappointed with this issue. I don't find the way to download the book again to see if the problem is part of missing parts of the file during download.